So you want to buy a baby tortoise for sale online, but are not sure what tortoise breeder to choose? The answer is plain and simple, here at Tortoise town, you will receive not only the best baby tortoise for sale but also the best care advice, and customer service of any reptile breeder, period. Most importantly, here at Tortoise town, we specialize in ONLY 100% captive bred tortoises for sale. Whether you’re looking for a captive bred baby tortoise, or well-started tortoises for sale online. Above all, Tortoise Town is your place for the highest quality, captive bred tortoises and turtles in the USA. Also, all of our tortoises are shipped overnight UPS for one flat low fee. Additionally, we guarantee top-notch care and customer service. Lastly, we offer the largest selection of tortoise for sale cheap online anywhere. We’ve got the nicest captive bred baby tortoises for sale cheap anywhere shipped nationwide! Choosing a new tortoise can be challenging. What size? What do they eat? How do I prepare their new habitat, etc? Therefore we offer free support with all of our purchases! Our customer support is offered via phone and email. Most importantly, Tortoise town has a real Biologist ON STAFF. Due to having a real biologist on staff, we provide our tortoise for sale and our customers with the best possible care advice for your new baby tortoise. If you’re looking for a cheap tortoise for sale, the larger species are typically the lowest price. Larger species have more eggs resulting in cheaper tortoises! Considering the number of eggs laid by the larger species, like the Sulcata. Sulcata tortoises lay up to 60 eggs per clutch, therefore they are considered a cheap tortoise for sale. As a rule of thumb, price shoppers are going to find the best prices within the larger tortoise breeds. The widest selection of tortoise for sale in the USA! Because tortoise town has a real biologist ON SITE, you can Shop with confidence! 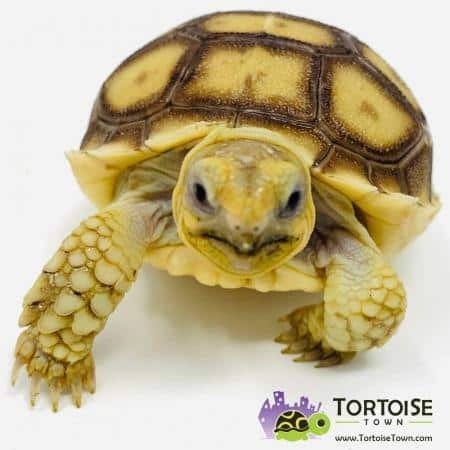 Tortoise town is your source for your next turtle for sale or baby tortoise for sale. Most noteworthy, tortoise town will be here to support you and your new family member as the year’s pass. Due to the fact that of our captive bred tortoise for sale near me will come with our full live arrival and a 7-day health guarantee! Because our baby tortoises for sale cheap are all hand raised, indoor, receiving top care from our staff of trained reptile caretakers and staff biologist. Searching for the perfect baby tortoise to add to your reptile family? Tortoise town has the largest selection of both large and small popular captive bred tortoises for sale. some of the tortoise species we offer for sale include: Sulcata tortoise for sale, captive bred Russian tortoise, baby red foot tortoise, baby Hermann’s tortoise, baby leopard tortoise, and Indian star tortoises. In contrast, if you are looking for an extremely large tortoise, choose the Sulcata (African spurred tortoise) or the Giant South African Leopard tortoise. Secondly, the next size down would be the more common baby leopard tortoise. Lastly, if you’re looking for a medium baby tortoise for sale, we would recommend considering the Red Foot Tortoise, Cherry Head Red Foot Tortoise, or Yellow Footed Tortoise. Looking for a very small tortoise? Consider the beautiful captive bred baby Russian tortoise as well as our eastern and western Hermann’s tortoise. Typically the Hermann’s will be friendlier, a bit more colorful and just as small as a Russian. Because Tortoise town has a full selection of 100% captive bred, hand raised baby tortoises for sale as juvenile and adults tortoises. Tortoises can make fantastic additions to any reptile family, so long as you do your homework on their care. Setting up the proper habitat for your baby is key. Paying attention to all the basic parameters while setting up your habitat is the best advice we could give. Alternatively, trying to “make adjustments” after your new shelled friend seems to be declining, is NOT the way you should be caring for a baby tort. Pay close attention to humidity. You will want your humidity of the new baby enclosure or baby tortoise habitat to be in the high range, typically in the 70-80% range. This even goes for dry area species. Unannounced to most, the microclimates that these babies exist in, in the wild are very humid and damp. Even torts from African for example, like the Sulcata or Leopard, do much better when raised in high humidity. Consider what tortoise size tortoise you are looking for! If searching for a cheap tortoise for sale, look at the larger species! When trying to find the perfect baby tortoise breeds, consider the size of the adult tortoise. Obviously, all baby tortoise are small and are cute as can be… However, in 15 years do you want a 4″ or 40″ giant tortoises is the question? When choosing a new baby tortoise for sale think about how big or small your new shelled friend will be in a decade. Consider what type of small tortoise you will have as an adult, or if a giant tortoise is what you seek what species.